Cassandra de Alba reads "Tchaikovsky, 1944"
Listen to a recording of Cassandra de Alba reading “Tchaikovsky, 1944.” The poem will appear in our next issue, due out in October. Cassandra de Alba’s work has appeared or is forthcoming in Red Lightbulbs, Amethyst Arsenic, Neon, and FRiGG. 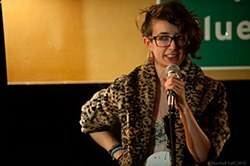 She has represented the NorthBEAST at three National Poetry Slams (with Slam Free or Die in 2008 and Hampshire County Slam Collective in 2010 and 2011) and performed up and down the East Coast with the No More Ribcage tour. She has published several chapbooks and is working on another, but title-wise is never going to top 2009’s i am running away and joining a circus whose only act is to make the audience feel really, really bad about being happy. She lives in Somerville, MA.